I wasn't entirely convinced that Pinterest was going to be all that fabulous. I wasn't ready to jump on the bandwagon. Then, like a reasonable person (which I totally am), I gave it a fair chance. And I'm hooked. It's a great place to 'pin' all of those things that catch my eye, that keep my creative juices flowing, and the things I aspire to make, create, bake.... it's slightly addictive. 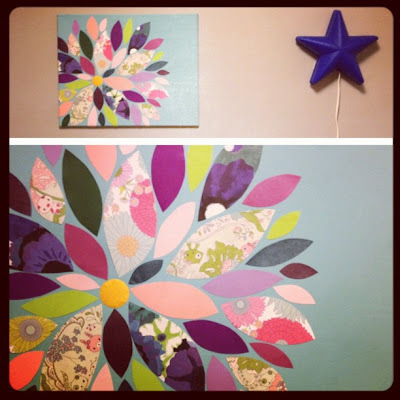 I stumbled upon a fun and easy art project that I wanted to do for Grace's nursery. It seemed simple and cute.... so I gave it a go. And I think if you have an afternoon, a little paint, and some paper you like that you, too, can make this. Yup. I am thoroughly impressed with the result and it cost less than $10! Start your project by painting the canvas in any acrylic color that strikes your fancy. I should a sky blue color for Gracie's nursery. Then, I chose three different patterned pieces of paper and a number of coordinating solids in flat and shiny textures. I considered using fabric but paper was cheaper and I was enamoured with a pattern so paper it was. I cut up the paper in approximate rectangles (your size should be reflective on the size of canvas you have and how many you want to add); then trimmed them into 'leaf' shapes. And I punched a circle out of yellow paper for the centre of the flower. Now, it's puzzle time. I started by placing the centre of the flower off-centre. Then, place the paper petals of various sizes and patterns around the centre as you please. I spent about an hour moving the petals around to get just the right shape and color variation. You, of course, can do this in mere minutes if you aren't picky. Or if you're particularly savvy :) A trick that worked great for me to see the positioning and patterns was to take pictures with my iPhone of the entire canvas. It somehow helps you gain a perspective of how it looks as a whole. Give it a go. The last step is to carefully lift each petal and add small dollops, or lines as I preferred, of hot glue to the backside and place them onto the canvas in its preset position. The original tutorial suggests finishing the entire piece with Mod Podge. I didn't not do this. I prefer the look of something that isn't perfectly polished. Then I hung it above Gracie's crib so she has something beautiful to gaze at.... because don't we all deserve a little beauty in our lives? Thanks for putting the step by step, Lei! I have two more free afternoons before we go on our little road trip to Kamloops and I am going to try this!! !